Jamie Oliver’s Italian. So you take a trip to Oxford and wander for a few hours around the beautiful grounds of its prestigious University. Downtown, you’ll find George street chock full of restaurants and of course Jamie Oliver’s is one of them. No choices need to be made, it’s a given that this guy’s food is bound to be good so off we went to Jamie’s Italian. High ceilings and rustic brick walls surround a maze of “farmhouse” looking wooden tables that are, of course, packed to the max! We waited a bit for one to open and soon enough we were granted access to the upstairs area. Right away, we were seated by a friendly tie-wearing waitress who explained Oliver’s concept of focusing mainly on fresh locally grown food. The menu was rather large featuring Italian classics but also a lot of interesting sides served in Oliver’s famous fashion: bold and inventive. 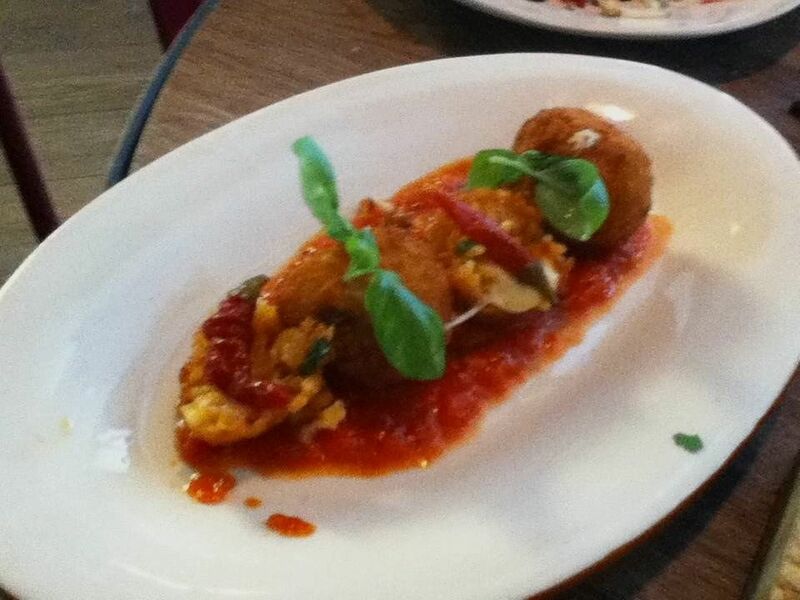 For instance, as an appetizer we ordered the crispy arancini: risotto balls stuffed with mozzarella and sweet red chillies served over arrabbiata sauce and Parmesan for £4.95. Crispy on the outside and bursting with spicy flavor inside. 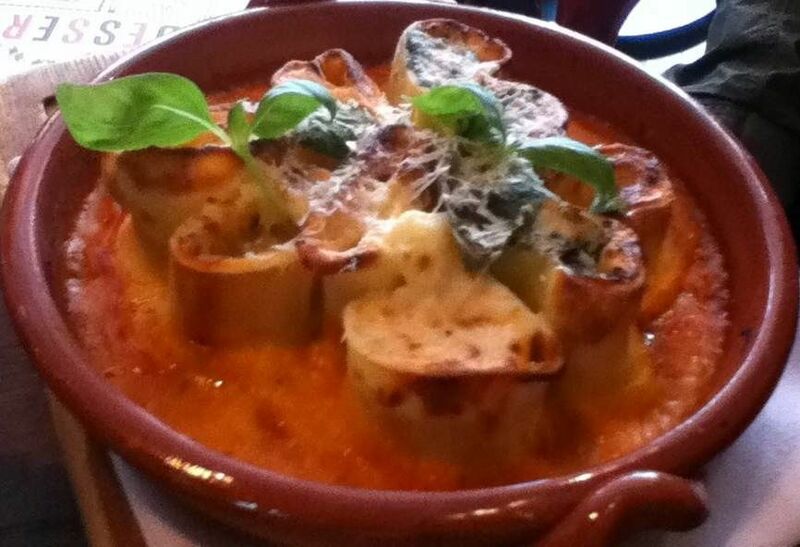 For the main course, we had the honeycomb canelloni 3 ways: aubergine & sundried tomato, pumpkin and ricotta with spinach. Creamy fillings inside several upright pasta tubes nestled in the shape of a honeycomb with cheesy edges over a rich béchamel and tomato sauce for £10.95. As a side, I had to try the famous polenta chips with rosemary salt and Parmesan. 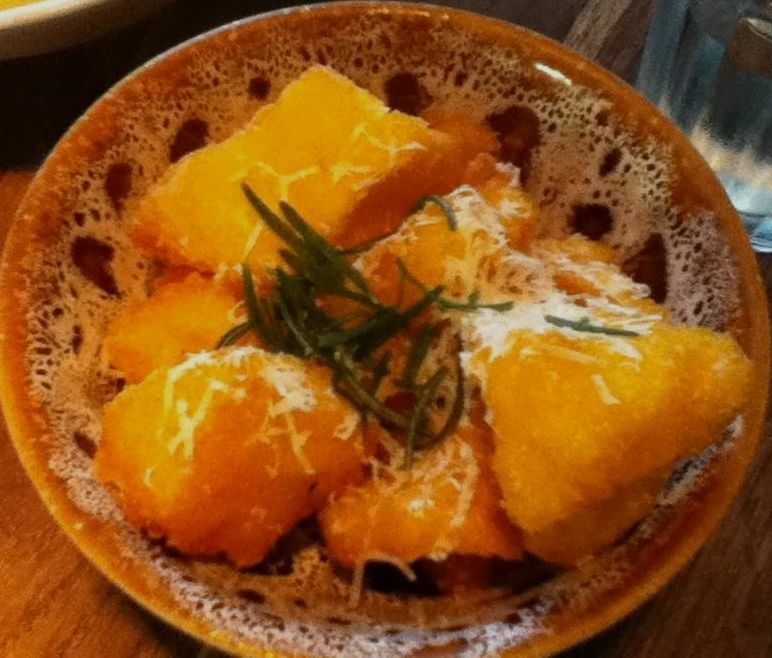 Large chunks of polenta crunchy on the outside yet very tender inside, absolutely delightful £3.45. On the other hand, the baked chestnut and mushrooms on “music” bread for £5.25, made with smoked mozzarella, was a little disappointing simply because the chestnuts were nowhere to be tasted. 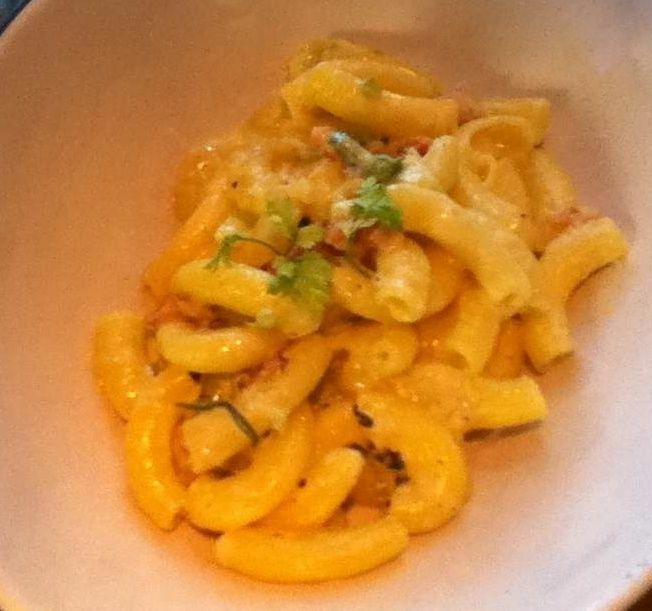 The penne carbonara was a nice surprise looking as good as it tasted. Served with crispy pancetta and wilted leeks with a lemon cream Parmesan sauce, zesty and silky for £10.75. The wine list consisted mostly of Italian reds and whites, as well as a few Spumantis. The house wine –Jamie’s Italian wines– are made with grapes from Sicily and are delivered in eco-friendly Tetra Paks that are decanted at the time of serving. The Bianco offers a hint of peach, the Rosso a touch of plum and cherry and the Rossato traces of raspberry and strawberry. All nicely priced between £4.90 a glass and £17.95 for a bottle. Another trademark at Oliver’s restaurants are his creative cocktails like the expresso martini, a mix of vodka, Kahlua and expresso for £7.25 or the Rossini made with prosecco and red berry purée for £6.60. For dessert, the homemade yogurt ice-cream, made with seasonal fruit, was light and refreshing for £4.90. The autumn rippled Pavlova served with cream , limoncello soaked fruit and hazelnut praline for £4.95 was way more creative and, of course, a nice end to our delicious” Oliver Twisted” meal. Una ensalada hecha con col rizada rica en antioxidantes, vitamina A y C . Las nueces añaden vitamina E y ácidos grasos omega 3. La quinoa es alta en proteina, magnesio y folato. Saltea la cebolla en un poco de aceite de oliva. Sala y deja caramelizar – unos 20 minutos. Mientras, pica el ajo y saltea en un poco de aceite de oliva, añade la quinoa y tuéstala un poco. Añade 1/4 taza de agua, deja hervir. Tapa y cocina a fuego lento durante 15 minutos. Cuando esté lista, retírala del fuego y déjala tapada unos cinco minutos. Destapa y remueve con un tenedor para soltarla. Lava la col rizada y sécala bien. Corta en tiras y ponla en un cuenco grande. Haz el aderezo mezclando el zumo de la naranja con el de limón, la miel y el aceite de oliva. Sazona con sal y pimienta y emulsifica bien con una varilla. Cubre la col rizada con el aderezo. Añade la quinoa, las nueces y los arándanos mezclando todo bien. Buen provecho! This is a highly nutritious and delicious salad. 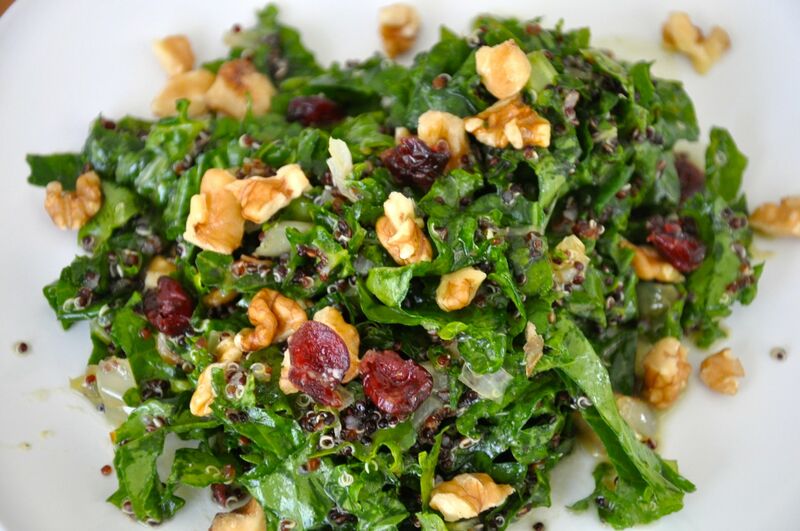 Kale, loaded with antioxidants, is high in vitamin A and C. Walnuts add vitamin E and omega 3s. Quinoa is a power food high in protein, magnesium and folate. Sautée the chopped onion, add salt and let it caramelize- about 20 minutes. Set aside. In the meantime, sautée minced garlic in a tbsp of olive oil, add quinoa and toast for a bit. Add 1/4 cup of water and bring to a boil. Cover and simmer for 15 minutes. Once done, remove from heat and let it sit for 5 minutes covered. Uncover and fluff with a fork. Wash kale and dry well. Chop in ribbons and place in a large bowl. Make dressing by mixing orange juice, lemon juice, 2 tbsp of honey, 1/4 cup of olive oil, salt and pepper to taste. Emulsify with a whisk. Cover kale with the dressing, mix well. Toss in quinoa, walnuts and cranberries. Enjoy! Right outside the city center, in the district of Alcantara hides a small eatery with some of the most traditional fare in town. Toscana, a quaint and small space, crowded with tables in every nook possible, serves an assortment of eighteen types of fresh fish and various cuts of meat. You can pick the fish you want to eat and they’ll grill it right in front of you. A big hit among those who worship anything char-grilled, Toscana has been whetting local’s appetites for over thirty years. It was originally owned by brothers Emídio and Carlos Pereira who ran the restaurant for over thirty years until they sold it to present owner Vitor Franco, who also has ensured that both tradition and standards remain, making it a favorite among many famous musicians, actors and politicians. No matter who’s been in charge, it has continuously been a labor of dedication that is clearly reflected in its wonderful food, impeccable service and inviting ambience. As you walk in, a warm welcome from the friendly and attentive staff will make you feel at ease. The menu is rather simple and most dishes are served with the usual side of salad, rice or french fries. But make no mistake, for the main offerings are anything but ordinary. I picked the bacalhau á Toscana which was in order for cod is the most popular fish choice in Portugal and my absolute favorite. 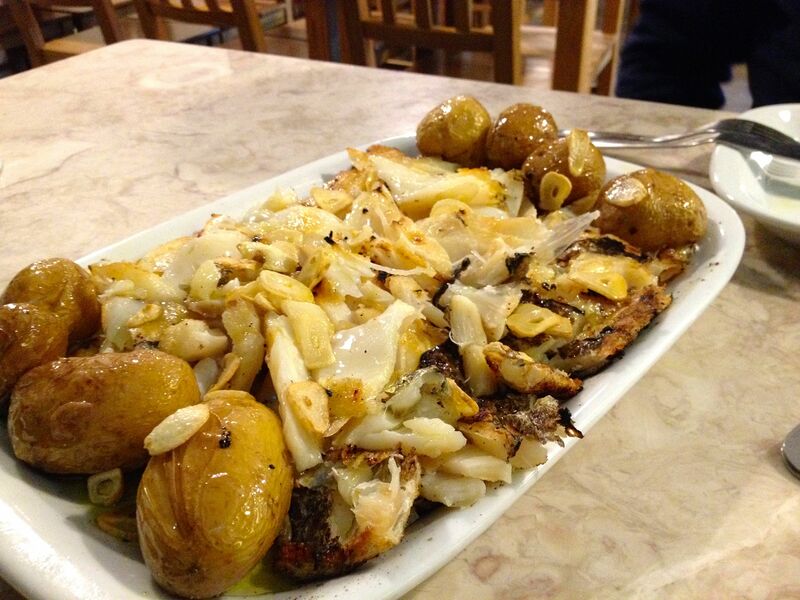 A nice portion of chargrilled cod and small potatoes drizzled with garlic and warm olive oil, a unique experience for those who can appreciate the mild flavor of this fish and its divine simplicity. Other great choices were sole, swordfish and bass. As for the meats, there were various sausages and several cuts of beef and pork like the secreto de porco preto, made with acorn-fed Iberian pig, famous for its tenderness and rich flavor. 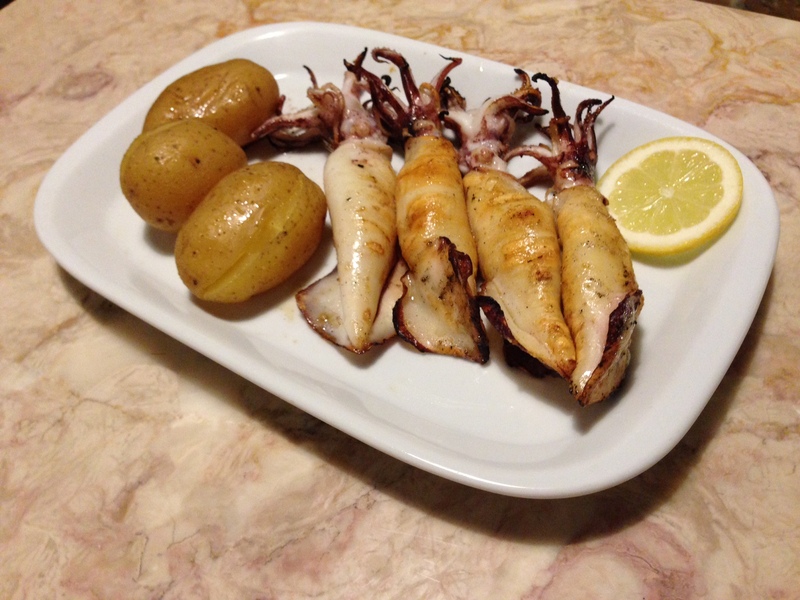 Another great hit were the lulas á mordomo, tender squid grilled to perfection served with potatoes. Again, another simple but delicious dish. As far as wines go, Toscana’s house one is served in jugs, both red and white, from two barrels placed on the wall. Portugal, a country of great vines, never fails to please no matter how simple the restaurant and this one couldn’t be any different. House wine, whenever ordered is usually pretty good and Toscana’s was outstanding! Vinoteca Moratín – Madrid, Spain. Okay, so one night you’re walking around Madrid “tapeando” , standing in bars, drinking and sampling small plates of food until you realize that you’d like a break from the crowds, and would rather sit down somewhere more quiet and be served. Then, you stumble upon Vinoteca Moratin. 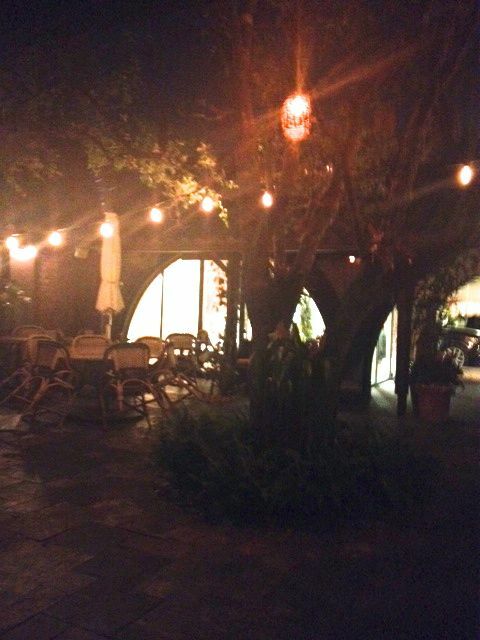 Right in the heart of bustling Barrio de las Letras, hides this small and intimate restaurant. 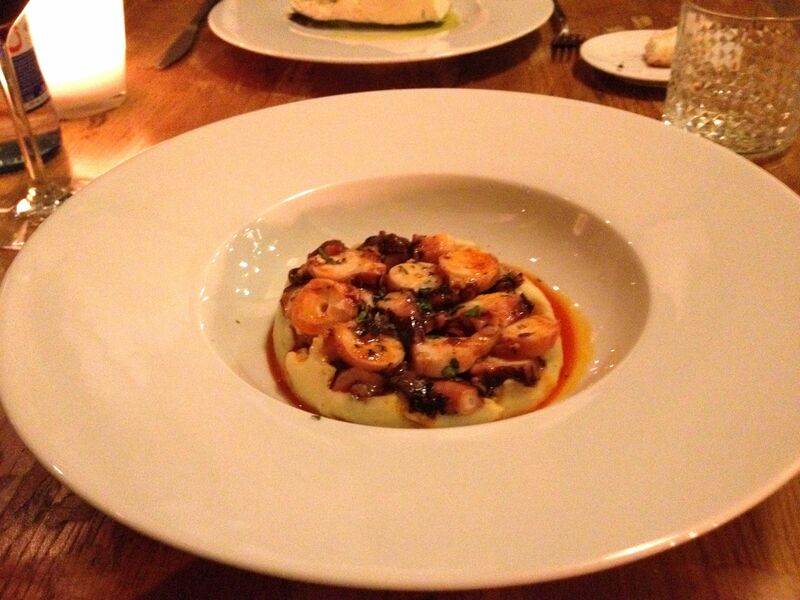 Even though its name: Vinoteca- wine cellar -evokes a fine wine list, its food is by no means compromised. Quite the contrary, for the menu is a true offering of the best local in-season produce as well as the finest meats and fish in the city. Yes, even though Madrid is landlocked, the freshest fish caught off the coasts of Spain is immediately shipped here, so wherever you eat, you’re bound to find a fresh catch. 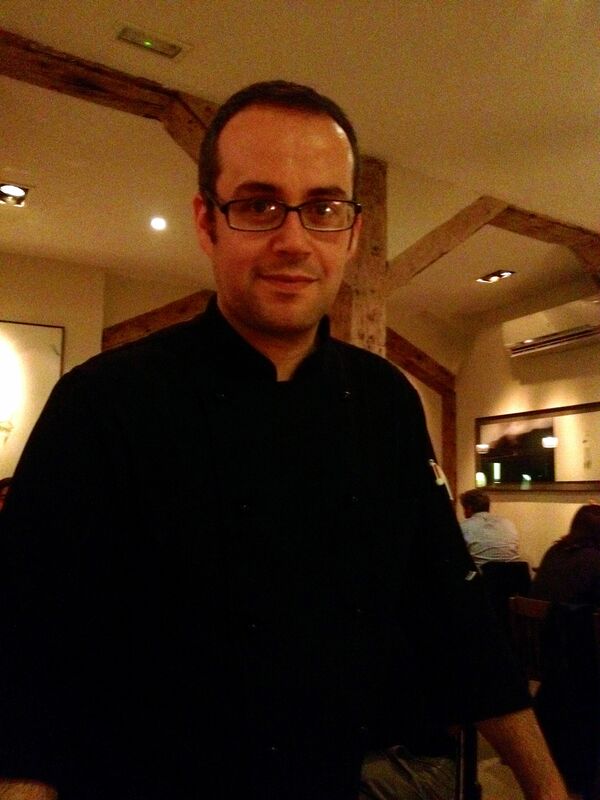 Chef and owner Marcos Gil opened this small eatery in 2012 following his passion for “buen vino” and great food. Here you’ll find a long list of over forty white wines, from Albariños to Ruedas and Rieslings to over 50 different red ones from Rioja, Ribera del Duero and Jumilla. Also on the list, are some French offerings from Loire and Burgundy, as well as some Portuguese from Alentejo. We were warmly welcomed by a waiter named Chema who sat us at a cozy table by the window. He offered us some wine to start with and we picked a bottle of Juan Gil from Jumilla in Murcia, a region that lately has gained a lot of attention for its fine crops. This particular one is made with the Monastrell grapes which gives it a smoky combination of violets and berries, full bodied yet smooth . 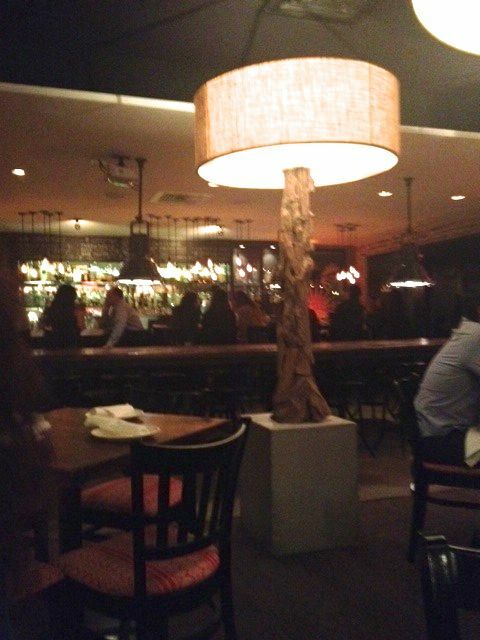 For a moment, I just wanted to sit in the dim lit ambience and savor my glass slowly as I admired the beautiful and serene decor . 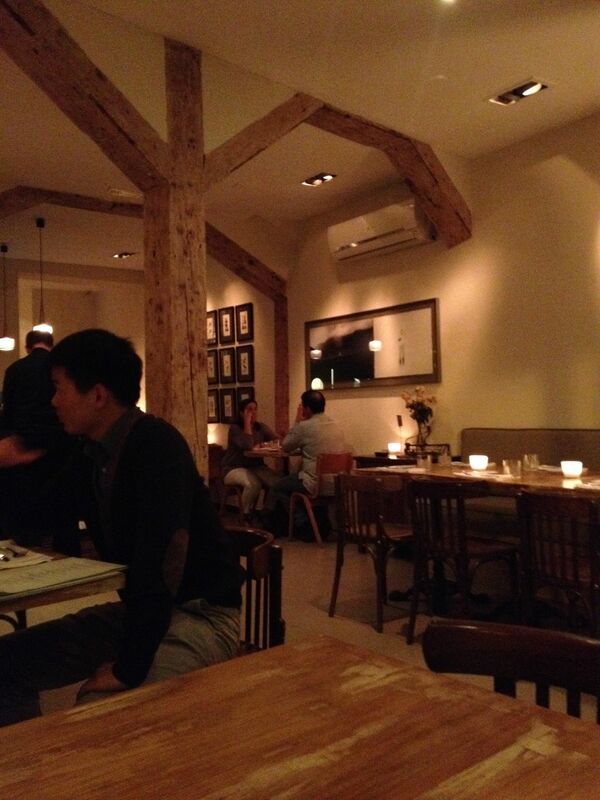 Old candle lit wooden tables surrounded by soothing earth toned walls add comfort and warmth to this lovely bistro. The attention to detail was evident, even in the acoustics where no matter how busy it was, it was never too loud. I was ready for another glass of wine and a look at the menu. A simple “carta” offering the best in season: Puerros con romesco. 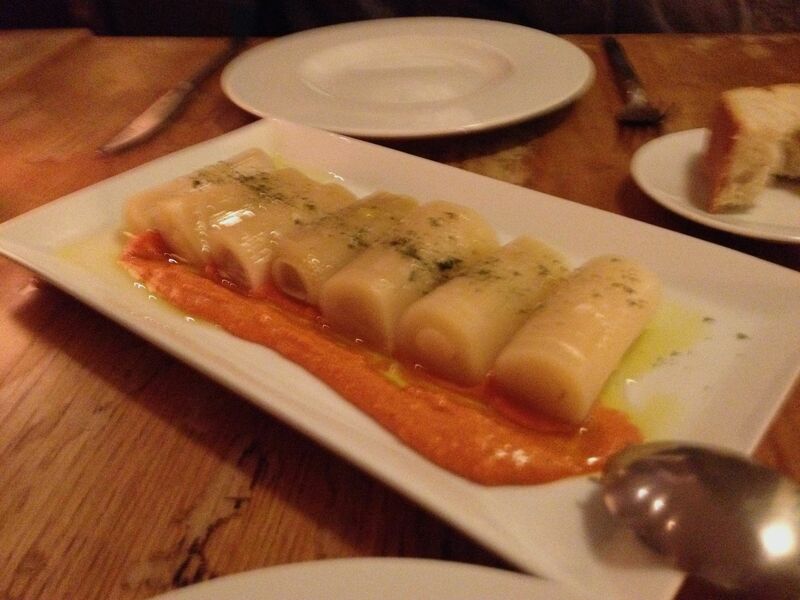 A generous appetizer of six mouth watering braised leeks served with tangy Romesco sauce made with almonds, hazelnuts and red peppers. Absolutely delicious! For my entrée, I had to have the pulpo de Santoña con aceite de pimentón y cilantro sobre parmentier de patata, small slices of the most tender octopus, seasoned with smoked paprika from Béjar and coriander, nestled over fluffy mashed potatoes. I could have easily ordered seconds but decided to take over my brother’s merluza al cava en papillote instead: hake steamed in Spanish sparkling wine, far too tempting! He wasn’t happy but he knew it was part of my job and begrudgingly obliged. Moist, flaky and “en su punto”. Another great example of what Spaniards can do with this delicate white fish. For dessert the suggestions are changed daily and the options are few. We split the tarta de manzana, an individual tart made with golden delicious apples garnished with a dollop of fresh Greek yogurt. As we dug into this decadent yet healthy dessert, we were offered a glass of Dow’s 10 year old tawny Port wine, a sweet mellow touch to the end of a delectable meal. The whole dining experience was almost spa-like, so relaxing I didn’t want to leave. Can’t wait to go back! Price range between 7 and 17 euros. 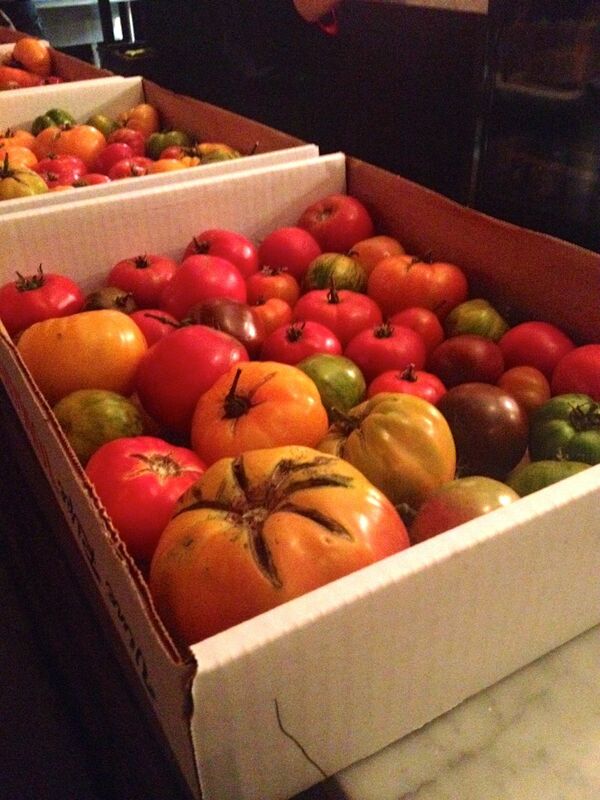 The latest craze in the Miami restaurant scene is to serve locally grown produce and that is what chef David Braca does best at Oak Tavern. As you walk through the vine arch of this ever so quaint eatery, you’ll stumble upon an open area reminiscent of a mediterranean patio surrounding a large old oak tree. Indoors, stands an open kitchen to your left and a nicely stocked bar to your right. In the center, reclaimed wooden tables and soft lighting surround a large communal slab in case you’re in the mood to make new friends. A nicely selected wine list offers glasses between $9 and $12 and bottles priced between $30 and $150. We opted for one of the more modest offerings: a bottle of Lagar de Cervera Albariño for $34, one of my favorite Spanish whites, fruity yet dry. The menu was also extensive consisting mostly of tapas, pizzas, seafood and house made charcuterie as well as several main courses. Even though the place wasn’t very busy, the service was a little slow. 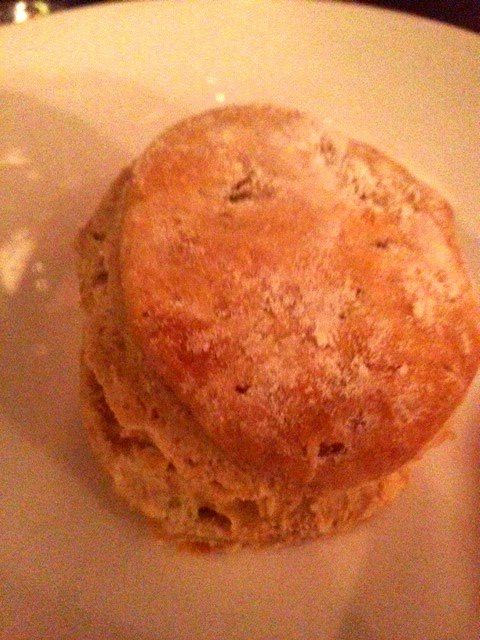 While waiting, I asked another server for some bread who kindly brought us some amazing homemade buttermilk biscuits with a side of butter, warm, flaky and absolutely divine! 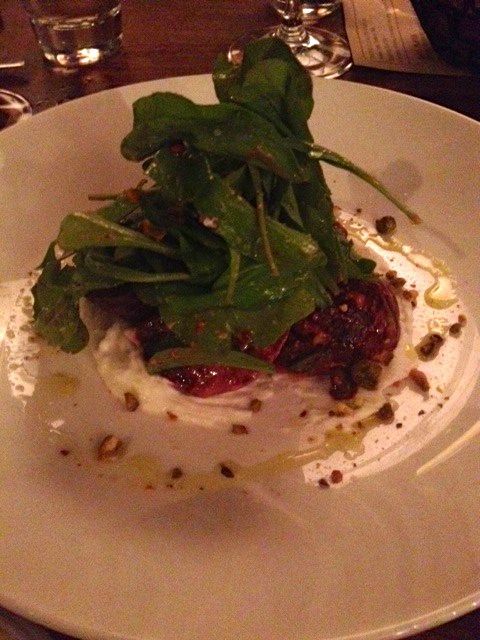 As soon as we got to order, we picked the local beet salad for $9, sweet roasted beets covered with arugula and a whipped goat cheese cream. The ever so light dressing was a smooth vinaigrette made with tiny bits of pistachios. The perfect starter: chunky, creamy and crunchy. The grilled octopus with smoked potato salad for $14 was a a little less exciting. The serving was very small and although it was very tender, a little too much “pimentón picante” (hot paprika) overpowered its flavor. Another choice we made was the roasted artichokes for $10. A large artichoke split in half with a side of citrus aioli, very delicate and sweet, barely needing any dressing. Unfortunately, being all women who shared a bottle of wine, we had to skip dessert this time! I will be back if only for the beet salad!